I have been busy, out of town, sick, you name it. I’m also behind. For the past several years I do something for my kids and their families for Advent. I call it Christmas Wishes. Throughout the year I collect little things: some of them are free, some are edible, some are just a few cents, and some are a real gift. Each item goes into a lunch bag. I make labels with the numbers 1-24 and use them to seal the bags. 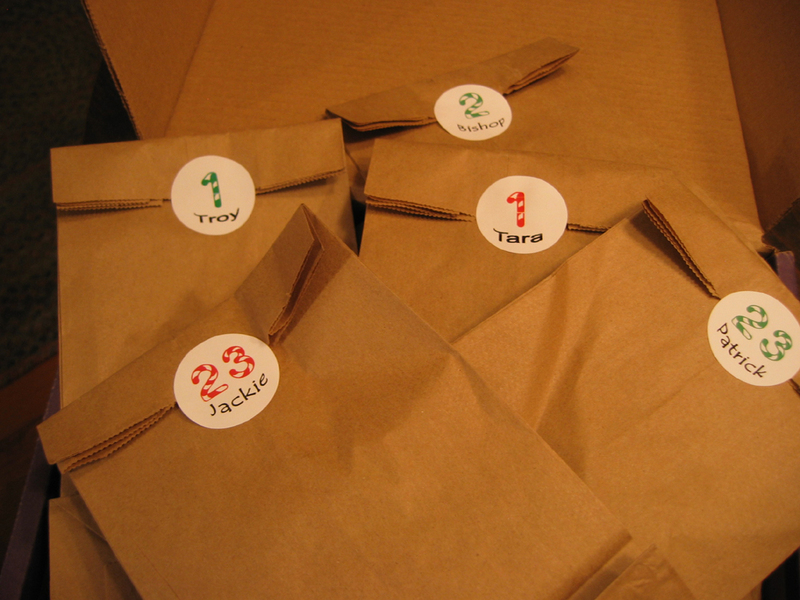 Each person opens their bag on the numbered day for a little treat. These are last year’s bags. I just finished bagging everything today. It’s the 1st of December. And these still need to be mailed. This entry was posted in Christmas and tagged advent, Christmas, Christmas wishes by Patti_is_knittinginflashes. Bookmark the permalink. You go girl!!!!! I don’t know how you get so much accomplished! You must NEVER sit and relax. The payoff is that your kids really like the little things you do. I love a surprise! Still more on top of things than I am. I just bought the first Christmas presents today.